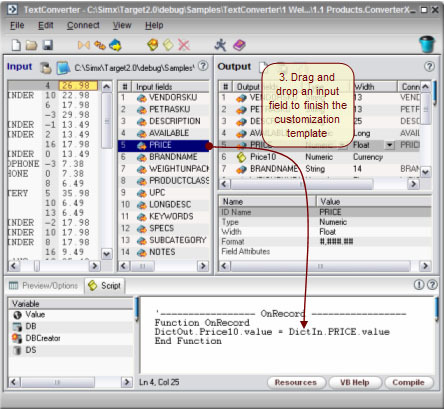 TextConverter provides support for the parsing with script including VBScript and regular expressions (regex). For text data and CSV files, support is also provided for arbitrary delimiters. Support for positional (fixed length) input is provided through high level script functions and support for positional (fixed length) output is also provided through the output data source UI. Data is extracted from the input document and converted to text preserving the original layout. To begin parsing with script, explore the samples provided with your software by choosing samples from the help menu. 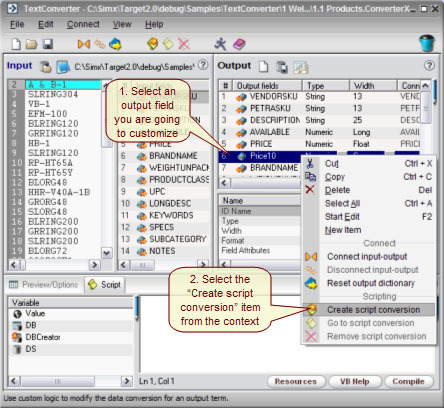 After you have explored the samples, read the documentation for all the specialized high level parsing functions and methods build into TextConverter through the .this object and the .target object. 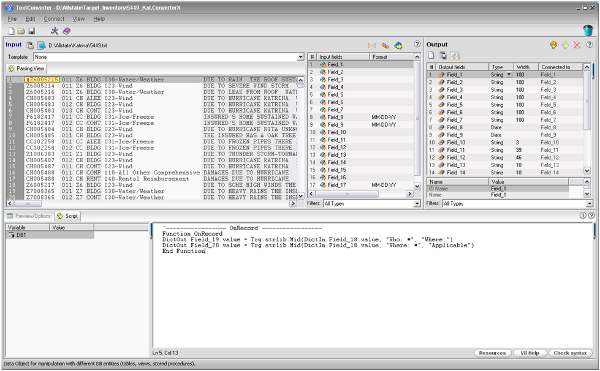 Screenshot of TextConverter in Manual mode showing the Scripting Tab. 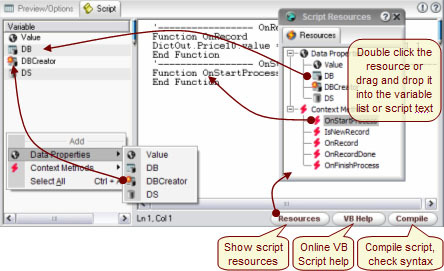 Scripting takes place in the script pane of the user interface. Scripting is a powerful, yet simple tool to achieve unlimited flexibility in data extraction, translation, mapping, and conversion. To search the script being edited press CTRL+F and a search dialog will appear. To search and replace, press CTRL+H. When you are editing a script the Ln (line) and Col (column) position of the cursor appear in the lower right corner of the scripting pane. Date Properties/Variables appear in the left half of the scripting pane. If you wish to hide/show this pane, click on the vertical blue pencil icon.